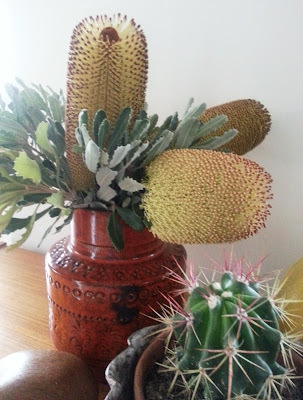 Please note, I didn't pilfer these from private gardens, they are council plantings - free for the picking (in my opinion. Yours?) As I said to Anth (as he walked away from me nonchalantly - pretending not to know me, and refusing to sully his hands with with what he called my criminal activities) "we pay our rates, we're entitled!" Anyway "pruning is necessary for optimum plant growth and flower yeild" It says so here, at Agwest, and they know their stuff. The Brown Pot, Margaret Preston, 1940. I love this painting. Image and more here. But I love your pottery and your second(?) credenza. You do have an incredible eye for the most unusual things. It would never have occurred to me to helpfully prune these plants as cut flowers. You are as conscientious as you are stylish. That's so striking Kylie! Really love that. And the vase is perfect for it. Oh..hubby and I love pruning our neighbourhood! 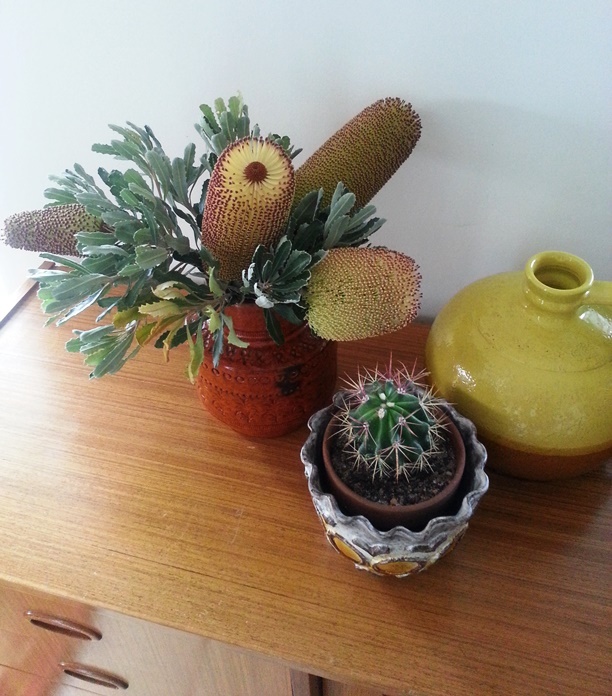 That vase youve chosen is lovely. i LOVE these, both naturally dry (?) and painted! to me they look just SO exotic! anthony's reaction being so recognizable. don't tell him. I always see sprigs of foliage and pretty flowers while walking but am not game enough to pick them. 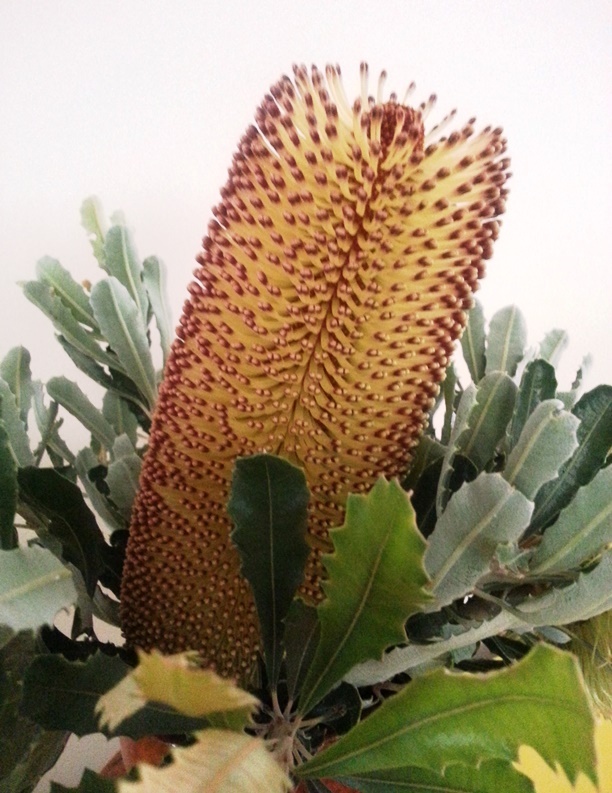 The banksias are stunning, and will last for weeks still looking great. Is that what they are! 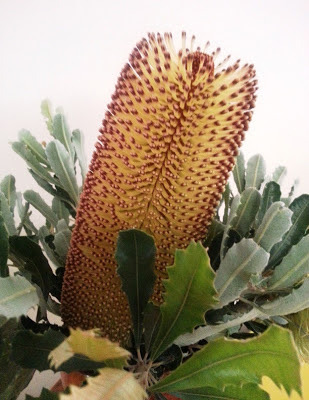 I saw them growing close to the opera house in Sydney harbour and had no idea what they were. I think May Gibbs used them in some of her book illustrations? 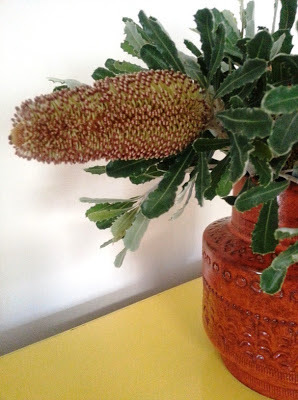 I did my own spot of roadside banksia pilfering this week. Too hard to resist! 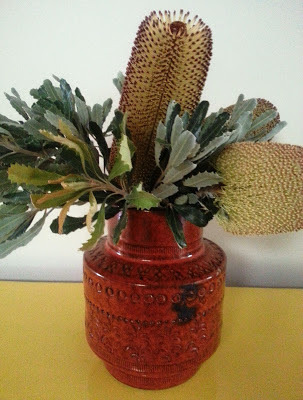 Yours look lovely in that vase. Fine with me. They are stunning. 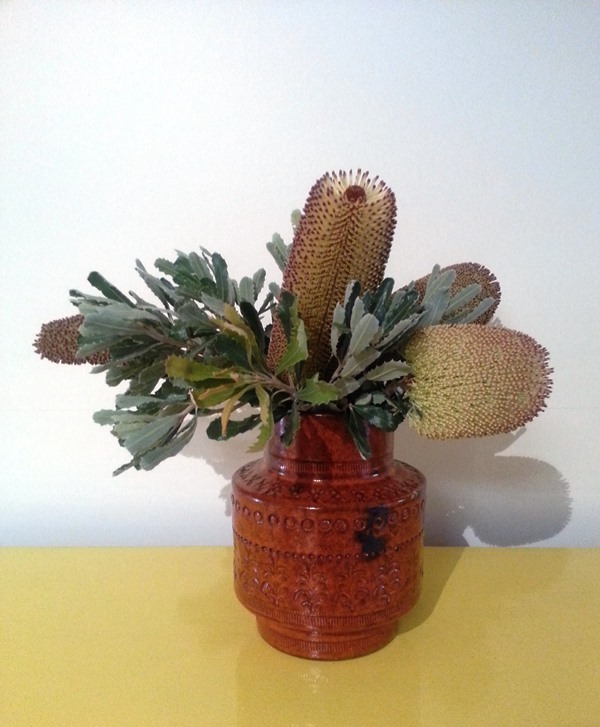 And I was just admiring another Margaret Preston painting in the art gallery myself today. Spooky. 'yours' if your rates are paid up. 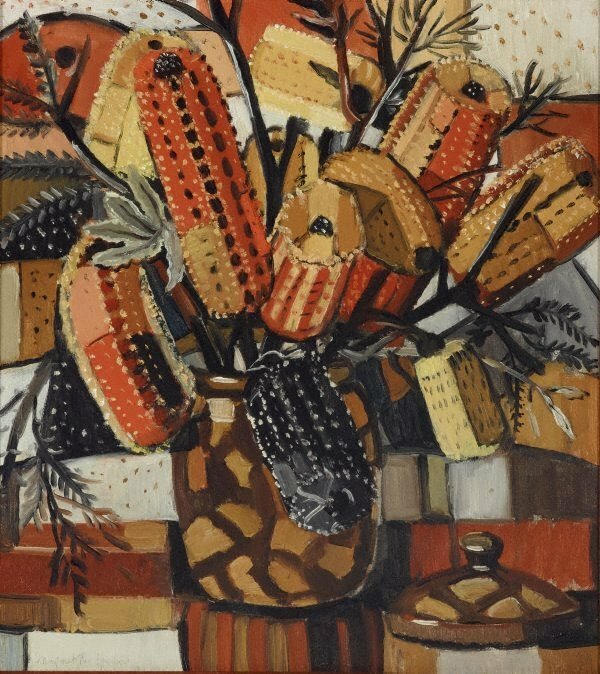 Lovely Margaret Preston, one I'd not seen before. I love her artworks. Hi Kylie, sorry I haven't been around for a while. Your posts always make me smile, I can just see Anth pretending not to know you while pruning the natives, he. Happy belated anniversary, not sure if I sent wishes already or not. I have been having a little break. OOOH! AAAH! I like your new look. Is it new? Am I behind the times? I love your flowers. I love your colouring choices. I love your taste in art. Dammit. I love you. Those plants!! Wow!! On a similar note, I got "caught" today taking pictures of a neighbor's mimosa! I wasn't doing anything wrong, and I was really at the edge of the road and not on his property, but I felt so criminal! LOL. Guess Whose Coming To Our Place?